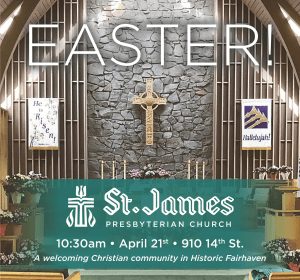 St. James Presbyterian Church, a welcoming Christian community in historic Fairhaven is seeking a Director of Children and Family Ministries. This position includes the oversight of our church’s Godly Play children’s Sunday program, supervision of Sunday school teachers, outreach and connection work with families, and the development of a ministry that serves our congregation’s growing population of young families and children. The ideal candidate has experience and enthusiasm for working with children and families, an ability to work creatively and collaboratively with other staff and volunteers, and a vision for how to strengthen and grow a ministry which helps form and nurture faith for all ages.